This letter was written by Charles R. Turner (1844-1904), the son of William Burwell Turner (1812-1890) and Rhoda Coe Remington (1810-1883) of Becket, Berkshire, Massachusetts. Turner enlisted in Co. E, 10th Massachusetts Infantry on 5 November 1863 at age nineteen and received $325 from town of Becket as bounty; he transferred 19 June 1864 to Co K, 37th Massachusetts and again on 21 June 1865 to Co. K, 20th Massachusetts. He was discharged from the service on 16 July 1865. Turner wrote the letter to his friend, William M. Crane (1841-1900). William was the son of Dorastus Crane (1794-1876) and Anna Merryfield (1799-1878) of Becket, Berkshire County, Massachusetts. An account of the excursion described by Turner in this letter is also given in greater detail in The Annals of the 10th Regiment Massachusetts Volunteers in the Rebellion edited by Joseph Keith Newell, pages 253-254. 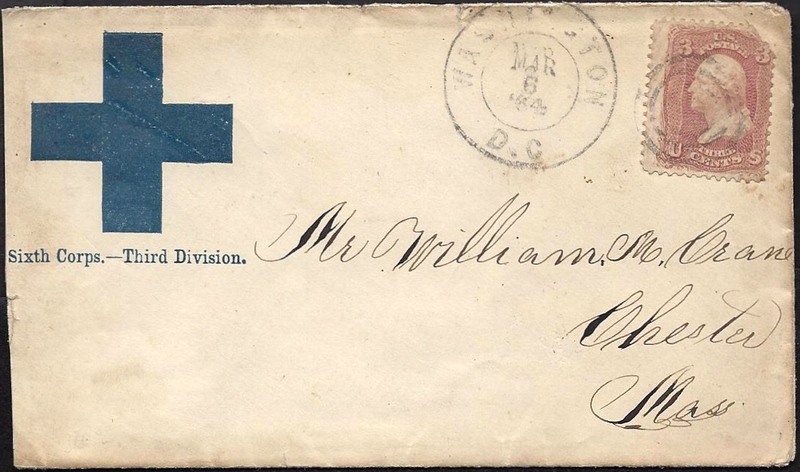 1864 Envelope bearing the Blue Cross Insignia of the Sixth Corps, Third Division, Army of the Potomac. I got your letter last night & got back to camp just at sun down. Glad to hear from you. I hope things are getting along first rate up there. I should think you would tickle her a little before she went, but I suppose you don’t do such things. But I wished I was there one night or two & I would see what I could do. Well Bill, I suppose you would like to hear the news. Saturday [27 February 1864] we started from camp and marched toward Culpepper & so on out towards the Blue Mountains. We went through Culpepper about noon. We went about 12 miles the first day and camped for the night [at James City] & in the morning we up & started & went out to the Robinson Creek [Robertson’s River] & crossed it & went about a mile & stopped for the next night. It stormed the next day [Monday, February 29, 1864] so we laid still & the next day [1 March 1864] we stayed until night. Then the cavalry began to come in and just as quick as they passed, we started towards camp. We came [back] across the [Robertson’s] River a little way & stopped for the night. Twas so dark that they thought they wouldn’t go no farther. Twas muddy as the old _____s. I see half a dozen of the boys tumble down in the mud. They were pretty-looking fellows when they got up. It cleared off that night & froze a little so twas a little better going the next morning for a few miles. Then twas pretty muddy but we came along in a hurry. You can judge for yourself whether we came in a hurry or not. We got into camp just at sundown & we had twenty-eight miles to come — pretty good march. I got my overcoat all wet & it was all-fired heavy. It is so long that it reached clear down to my feet. You had better believe I had a load. Holly ¹ stood it pretty well but he got pretty well played before he got into camp. He got a little behind but he got in less than half an hour. The cavalry [led by Custer] went out by Madison Court House & so on toward Gordonsville. They had a considerable of a brush with the rebs two or three times but they whipped them every time & drove them most to Gordonsville. They said that the rebs were coming in from Richmond as fast as they could bring them. They said they were as thick as a swarm of mosquitoes & they said that they were following us up so we hiked back to camp. They were two to one for they had about three corps of them, so the cavalry said, & we didn’t have nothing but the Second Corps and part of the Third. I didn’t happen to get into a fight this time. Well Bill, I shall have to stop. Write soon. From Friend, — Charles R. Turner, Washington, D.C.
¹ Holly C. Clark, farmer, was born at Becket, Massachusetts, 20 November 1847. He enlisted in the 10th Massachusetts on 5 November 1863 and received $325 bounty from the town of Becket. He transferred to Co. B, 37th Massachusetts on 19 June 1864. 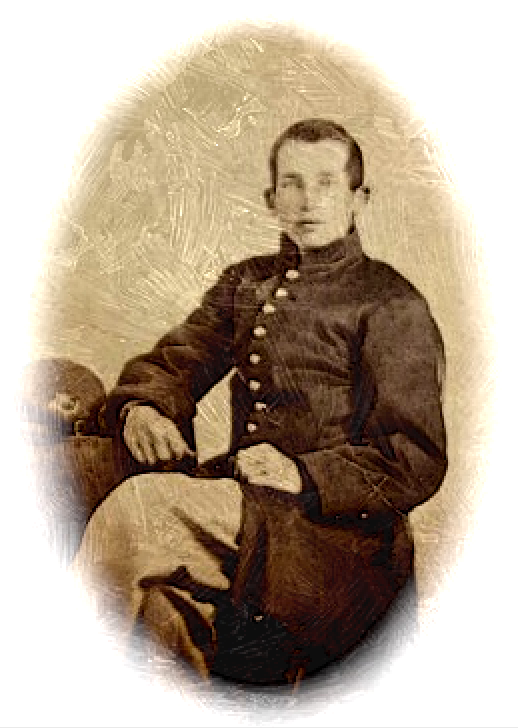 He was wounded at Sailor’s Creek, 6 April 1865 through the left shoulder and discharged from Hick’s Hospital in Baltimore on 5 October 1865. In 1869 he was a teacher in the public schools at Chester, Massachusetts.